I'll be the first to declare my love for Japanese craft books. The instructions are always so well photographed and illustrated and anything that can be charted, is, so that the obvious language barrier has had no impact on their usefulness. I'm beginning to amass a nice little collection of knitting and crocheting books from Japan and I refer to them often. But I'm a relatively experienced knitter and crocheter, so it is only a matter of moments for me to translate the symbols based on the accompanying photographic tutorials. I am not, however, an experienced tatter. Learning to tat from a Japanese crafting book was not my wisest choice. Still, there's something rather exciting about failing and then figuring out the solution. Well, it's exciting after the fact. During, it's infuriating. My little samples show a range of mistakes and uneven tension but the results are still gratifying. The finer threads are a little more forgiving, presuming your vision is average or worse. The thicker pearl cotton shown above, shows every little misstep. It probably doesn't help that I hate the color. 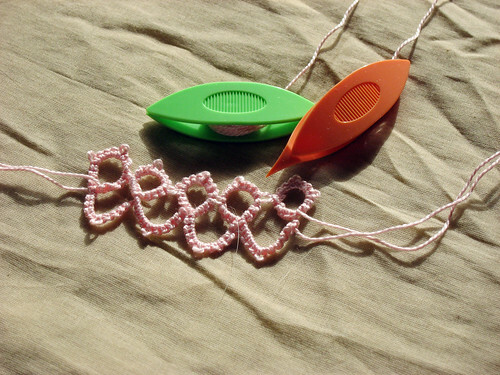 I definitely want to build skill enough to use tatting as an edge treatment on a knitted piece. It'll be a challenge to keep it from being overly dainty and twee, but who doesn't love a challenge? Wow, its very pretty! I've never heard of tatting before. What will you do with it when its done? Hmmm, I may have to find a book to teach me! Nice work! I think tatting would look nice as an edging - very cool idea. You're doing better than I ever did with tatting. But then, I think my bobbin was a lousy one and then, I've never been crazy about the look of tatting, either. For me (and this is just FOR me), I prefer my lace to be airier, like bobbin lace or knitted lace. I like tatted things done by other people and in moderate doses, but never felt driven to really master it myself. Which explains why I gave up so quickly (grin). You, however, are obviously going like gangbusters, so that's clearly not a problem for you! Seriously, is there no end to your creativity? I have an OLD book from my grandma that showed the 4 basic skills that any woman needed to know...how to knit, crochet, tat, and embroider. Someday I'll tell you about the cookbook. At age seventeen (a LONG time ago!) I taught myself to tat from a poorly written Coats and Clarks book. Not long after that I bought many more tatting books, among them a Japanese tatting book from which I learned a better way!! I loved the Japanese book, the diagrams were far superior to the others. Keep at it, there are a lot of ways to use tatting. I have even done a little experiment with some of my fine handspun wool using a small tapestry shuttle, it's more cumbersom than those sweet little Clover Shuttles but holds more. I am planning to do a scarf at some point! I have wanted to learn to tat since I was a little girl back in the 50' & watched my aunt (by marriage - she was from England & practiced all the traditional homely crafts to an excellent degree). Her fingers would fly & she produced the most amazingly beautiful, delicate lace (I'm not sure what she did with it - bed linens & hankies maye). 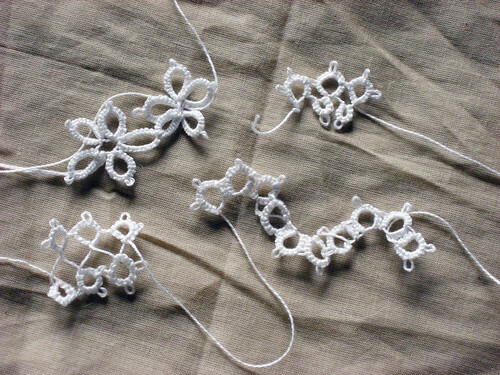 I've done some tatting - not recently, but long ago. I always found that, though I understood the pattern directions, it was a whole lot easier if there was a picture. Never found it intuitive at all. I've seen some people using a long needle for tatting instead of a shuttle - supposedly it's a lot easier. Need to pursue that someday. Oh.. how do you do that? Is it fun to play with? Looks lovely, like lace! Got to go show Mum about this. Or go to my blog and click on the many links of other tatters. We love to help beginners! or email me for online links to videos showing the stitches and easy patterns. tatting looks magical to me and one day i hope to learn. Keep tatting! You're doing fine...I am well aware that this is an older post, but I just had to put my two bits in here, too! LOL! This page contains a single entry by Marnie published on February 20, 2008 4:22 PM. Fantastic Birthday Weekend was the previous entry in this blog. Accessorizing is the next entry in this blog.